Ummm, yes, I did just used the word "poop" in my blog title. Stay with me though, I can explain. I'm not sure about where you live but here in Northern Colorado it's hot! Too hot to heat up the oven, at least that's what I think. So, what's a girl to do if she wants a home made cookie but doesn't want to bake? Well, she makes Gorilla Poop cookies of course! I'm not sure where that name came from. I've called them that for as long as I can remember and my kids think it's both gross and funny which some how, magically, makes the cookies taste even better. So, have you heard of them? 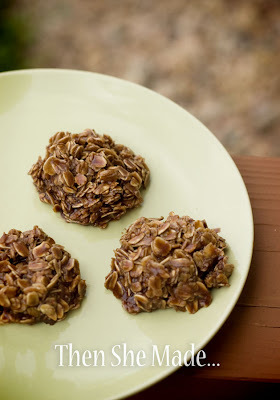 Normal people call them No-bake cookies - we're clearly not normal and Gorilla Poop is way more fun to say. Mix butter, cocoa, milk and sugar in a pan. Melt together while stirring. Bring to a boil and boil for 2 minutes. Remove from heat and add in oatmeal. Mix well and drop by the spoonful onto wax paper. Let set and cool. Then eat and enjoy! They are quick, easy, and take only a matter of minutes to make. Now that is my kind of a cookie! I am here in Colorado too and it IS WAY TOO HOT to bake for real. I love these cookies too - but we called them Cow Plop cookies where I grew up in Canada. It's ok to not be normal - no bakes is a boring name! Thanks for the reminder of these! At Christmas time I added crushed candy canes to a batch and it was called Reindeer poop. I just may make a batch of gp tomorrow. I am laughing so hard it's hurting my incision! I love both those names, "Gorilla Poop" and "Cow Plop Cookies." They are much more exciting than "No-bake." Question.. if there are any leftover :)... Would these need to be refrigerated due to milk? Thanks! I have never made no bake cookies before.. and I am NOT a Baker... So these are up my alley!! Mmm. LOVE no-bake cookies! But if I make them myself, they never set. I eat them while they're still hot. I have been eating these treats my entire life but never heard them called "gorilla poop," but I love that name - so appropriate in hw they look. I add a cup of coconut and a half cup or so of chopped walnuts to make them even more tasty.